Connecting Country is excited to host an interactive workshop in conjunction with the Centre for eResearch and Digital Innovation on Friday 22 of March in Castlemaine. 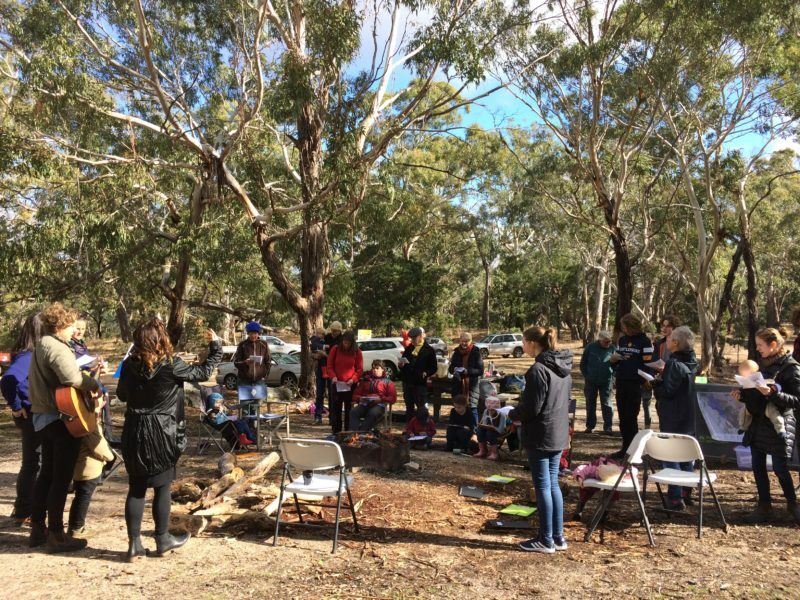 This interactive workshop is part of Connecting Country’s Habitat Health Check project (click here for more information), funded by the Helen Macpherson Smith Trust over the next two years. This project aims to review our long-term monitoring programs, to shift to a monitoring model that empowers our community to conduct robust biodiversity monitoring, and, importantly, to ensure that the data we collect is being shared and used appropriately. To meet this third goal, we are working with the Centre for eResearch and Digital Innovation (CeRDI) at Federation University Australia. CeRDI has developed many award-winning web-based spatial information and knowledge portals that provide public access to data sets that are often hidden from view. The team at CeRDI have great resources that are relevant to us at Connecting Country and are well worth checking out. Please come and join us at the lovely Garden Room within the grounds of Buda Historic Home and Garden for this free workshop. Workshop numbers are limited, so please book. Connecting Country’s major monitoring project over the next two years is our Habitat Health Check (click here for more information), funded by the Helen Macpherson Smith Trust. This project aims to review our long-term monitoring programs, to shift to a monitoring model that empowers our community to conduct robust biodiversity monitoring, and, importantly, to ensure that the data we collect is being shared and used appropriately. To meet this third goal, we will be working with Centre for eResearch and Digital Innovation (CeRDI) at Federation University Australia. CeRDI has developed many award-winning web-based spatial information and knowledge portals that provide public access to data sets that are often hidden from view. The team at CeRDI have two great resources that are relevant to us at Connecting Country and are well worth checking out. Firstly, The State Wide Integrated Flora and Fauna Teams (SWIFFT) is a network for knowledge sharing and information exchange that supports conservation and management of threatened species, biodiversity and the natural environment across Victoria. You can explore a map displaying the range projects that are part of the network (click here), or see a list of their projects (click here). As part of Habitat Health Check we will be making sure that Connecting Country has a presence on this fantastic website. Secondly, CeRDI has developed the Visualising Victoria’s Biodiversity (VVB) tool (click here). VVB consolidates access to spatial environmental datasets and information – created and managed by government agencies, organisations, community groups and individuals – into a user friendly and interactive platform. You could use this platform to view, for example, records of mammals or birds near your property. CeRDI is one of many places for sharing and visualising nature data in Victoria – you can see a wonderful infographic on how these interact by clicking here. Want to know more? 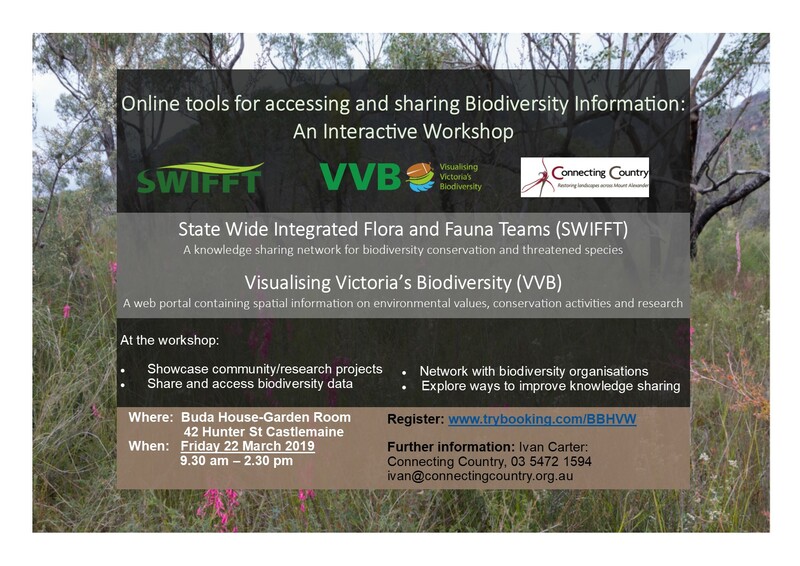 We’ll be running a workshop with CeRDI (Date to be confirmed) to learn about the power of the Visualising Victoria’s Biodiversity tool. More information to come soon – watch this space! It’s that time of year again! 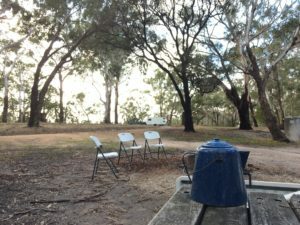 Details of the sixth Camp Out on the Mount are now available and registrations are open. Please join Connecting Country, Little Habitat Heroes and local Landcare groups to celebrate the beautiful Leanganook (Mount Alexander) and the fabulous work that Landcare and Friends groups do all year round. This free event is supported by funding from the North Central Catchment Management Authority through the Victorian Landcare Program, as well as Mount Alexander Shire Council, Friends of the Box-Ironbark Forests, and Little Habitat Heroes. We will have guest presenters from Dja Dja Wurrung Clans Aboriginal Corporation, Parks Victoria and Bendigo TAFE, along with local authors and artists. Yummy food will also be provided by the Harcourt Lions Club, Murnong Mummas, and the Camp Out Damper Team. Below is a run-down of the Camp Out on the Mount 2019 program. You are more than welcome to attend some or all of the activities. Please let us know through the booking website which activities you plan to attend, as this will help us in planning how many people to cater for. Please note: activities will be cancelled in the case of severe weather.